Each person lives in their own bubble. As time passes, we realize that none of us is really the same. We have our own thoughts, preferences, and lifestyles. So, it makes sense to surround ourselves with things that address our particular needs. We can only interact with our environment if we know precisely what it is. This is why an increasing number of people are opting for personal weather stations. They provide precise data that is specifically relevant to us, as opposed to the weather services that cover large areas. One product that gives you detailed information about your environment is the Weather Station by Netatmo, a French company specializing in smart and innovative home appliances. It’s somewhat misleading to call this device a weather station since it’s both more and less than that. It provides less data than similar devices from other manufacturers but has useful features you are not likely to find elsewhere. The kit measures not only temperature, humidity, and barometric pressure, but also air quality and noise levels, information most homes could benefit from. It’s also a smart device that lets you use the data for specific purposes. The Netatmo Weather Station is designed for most average, health-conscious households. If you are happy with basic weather readings, then this might be a good choice for you. Also, if you have a family with a newborn baby, then this device will help you maintain the perfect indoor conditions. Advanced weather enthusiasts would probably expect wind and rainfall measurements, which this device doesn’t offer (although you can buy them separately as add-ons). Also, professionals in specific areas will certainly find the product lacking, as there is no way to measure things like soil conditions or leaf wetness. The Netatmo Weather Station offers multiple functions, but its goal is to give you information that can be relevant for a healthy lifestyle rather than provide unfiltered weather data. Both the outdoor and the indoor module come with temperature sensors. The outside sensor can measure temperatures between -40°F and 150°F. This is within the range most populated areas can expect. Indoor temperatures between 32°F and 112°F can also be recorded. The relative humidity is also logged by both sensors, from 0% to 100%. The sensors that are conspicuously missing, if only because they are part of most other weather stations, are those for rainfall, wind strength, and wind direction. You can buy these separately, and many will be tempted to, as the device seems somewhat deficient without them. 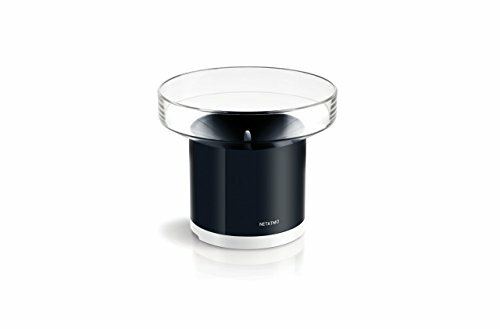 With most home stations, the outside sensors are the core of the device, while the indoor sensors tacked on to the console are almost an afterthought; with the Netatmo, the situation is the opposite. It’s focused on making life indoors easier since this is where we spend most of our time. One feature that shows this is the air quality sensor. It measures indoor pollution with a CO2 gauge. It can measure up to 5000 ppm, but since this is meaningless to most people, it will also show colors depending on how polluted the air in your home is. Green means low CO2 levels, yellow is average, while red means you should open a window immediately. Another useful feature that has nothing to do with the weather, but is good for your peace of mind, is the sound meter. It’s easy to neglect how much noise we’re exposing ourselves to, so this serves as a useful reminder. It measures sounds from 35 dB to 120 dB and you can set an alert for when the noise exceeds the level that can cause damage to your hearing. The indoor and outdoor sensors wirelessly connect to each other up to 330 feet. They both use your home’s Wi-Fi to send the data to your devices and stream it online, to services like Weather Underground. The readings are updated every 5 minutes. You can view all the information your station provides through the free app. It allows for remote access to your station’s data at any time. In the app, you can also look at previous measurements to spot trends. Graphs are easily available for the parameters you choose. You also get a 7-day forecast for your area. From the app, you can connect the device to virtual assistants, like Amazon’s Alexa, or your other smart appliances. That makes it easy to schedule tasks. You could set your smart home device to close the blinds and turn on air conditioning when the temperature reaches a certain value, for example. Last but not least, the modules boast a clean, modern design. Both the indoor and the outdoor sensors come in a solid, one-piece aluminum body. The station isn’t something you will have to hide, as it won’t look out of place in any home. 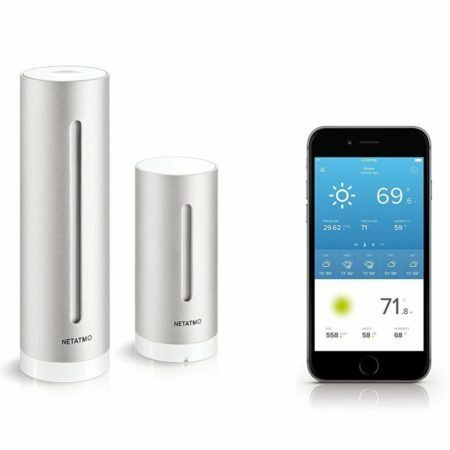 The Netatmo Weather Station is simple to set up and use. The outside module can be mounted to any wall with the help of a nail or a screw. The software configuration poses no problems and your station will be up and running in no time! Here’s a useful user video that will guide you through the steps. Many users will be completely happy with the ​Netatmo Weather Station, but it very clearly isn’t for everyone. Those who want a weather station that focuses on actual weather conditions should look into more advanced solutions. For example, the Ambient Weather WS-2902A offers a lot more information about the weather, so it’s not likely to disappoint even the more expert users. 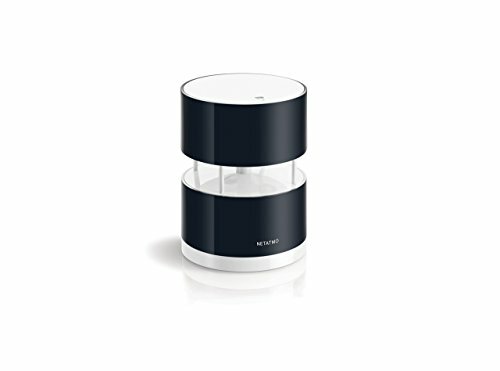 The Netatmo Weather Station is better described as a multipurpose device that will provide important info for your family’s health. It integrates easily into any smart home. As far as weather readings are concerned, you’d be better advised to look elsewhere for detailed and diverse measurements.